Brad Schmett of Luxury Homes by Keller Williams has today announced that the now in full swing, Orange County Fair, running from July 15 through August 14, 2016 at the Orange County Fair and Event Center in Costa Mesa will attract plenty of luxury home shoppers for the nearby Inland Empire. Only a short distance away, Southern California’s Inland Empire is considered the last frontier of affordable housing. For 23 days we can all indulge our inner child and eat things like deep-fried butter and deep-fried Twinkies. Brad Schmett, Broker Associate with Luxury Homes by Keller Williams today announced that the fabulous Orange County Fair which opened this week at the Orange County Fair and Event Center in Costa Mesa, will be a huge draw for Inland Empire luxury home buyers thanks to the close proximity between Orange and Riverside counties. Set to run through August 14, 2016 the fair is one of the most anticipated events of the year in Southern California. A full agenda of major events is planned during the course of the fair. A Junior Livestock Auction on July 23 will be held at the Livestock Show Ring. The Courtyard Wine Seminars are also among the most popular competitions at the fair, presented by the Orange County Wine Society every weekend until the fair closes. A wide range of entertainment will also be on tap including mariachis, the popular hypnotist Mark Yusuik, Blues guitarist Bill Magee, The Road Kill Kings and many more. Don’t forget to check and see if your own hometown is part of the City Days Community Flag Salutes which occur almost every day of the fair and honor local communities. The fair is closed on Mondays and Tuesdays. 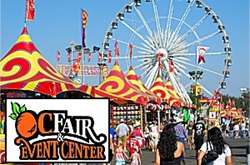 For more information on the Orange County Fair visit http://www.ocfair.com/2016/generalinformation/Fairhours.asp. To find out more about investing in Inland Empire real estate visit http://Inlandempire.bradschmettgroup.com. About Luxury Homes by Keller Williams: Luxury Homes by Keller Williams – Inland Empire is an exclusive, elite and sophisticated group of real estate consultants raising the bar for service in the real estate market.